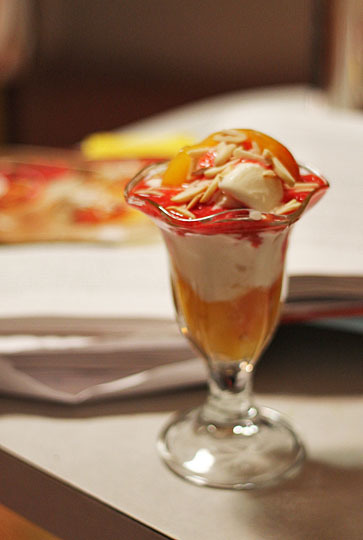 This week’s French Fridays with Dorie was Peach Melba, which I didn’t really know what it was before I made it. Does it involve toast? No. Not at all. 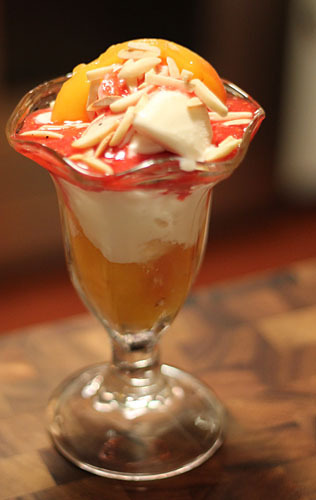 It’s infused, poached peaches, ice cream (or in my case Greek vanilla frozen yogurt), almonds, raspberry sauce and fruity French liqueur. Bring it on, I say. The only bad thing is that I waited until the last possible minute to make this so I didn’t get around to taking pictures until around 8:30 PM, so my lighting is pretty bad. Bummer. 1. Like I mentioned above, I opted for frozen yogurt to lighten it up a bit. 2. The liqueur I had was Creme de Cassis, so that’s what I used. 3. Oh! 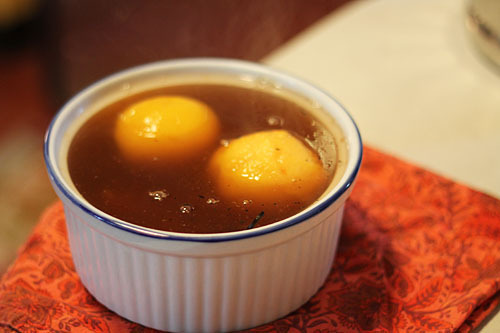 In lieu of lemon verbana leaves, I put about a 1/2 teaspoon of lemongrass paste in the poaching liquid. I’m not sure if it made a difference, but it sounded fun. 4. 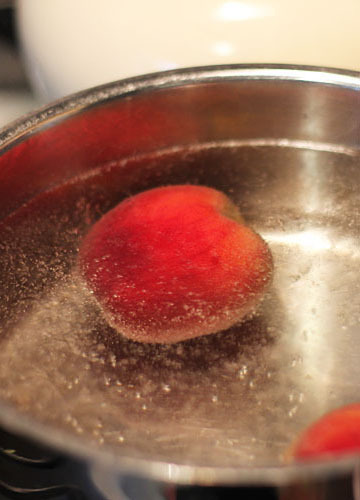 Before I put my peaches in the boiling water, I put a little “x” on each one, to make the skin easier to remove. 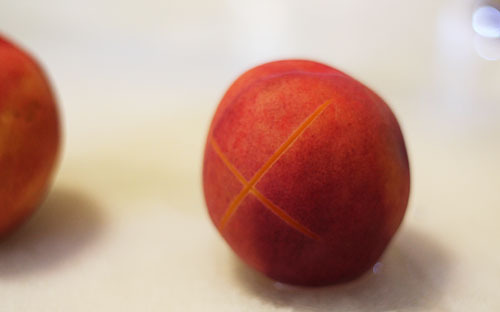 I’m surprised Dorie didn’t say to do that in the directions…that’s how I always thought you were supposed to do it to make the peaches easier to peel. 5. There were a lot of steps to this but the end result was pretty good! Okay, photos and a link to everyone’s posts. My “X” for easy peeling. The poaching accoutrements, along with the peeled peaches. 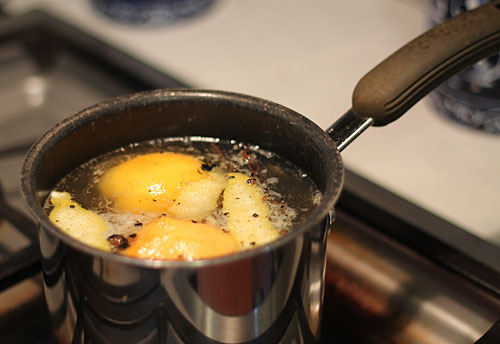 Poaching with the water, sugar, vanilla bean and lemongrass paste. 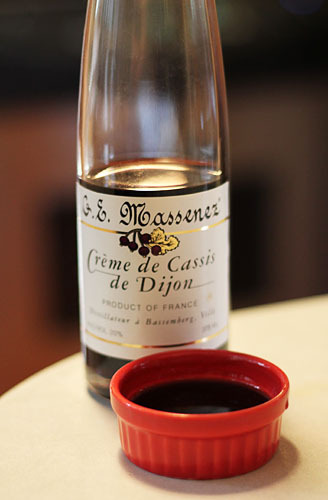 Creme de Cassis…black currant liqueur. Cooling down in the poaching liquid. Lovely job. This was the first time I had had this dessert as well. It was a nice summer treat. Great job! I liked this dessert also. Your dessert looks wonderful. I liked this too, especially the syrup. Happy Friday! This was a first for me, too! Yours looks wonderfull…love that you made it with yogurt…I did that for breakfast this morning with the left over peach! 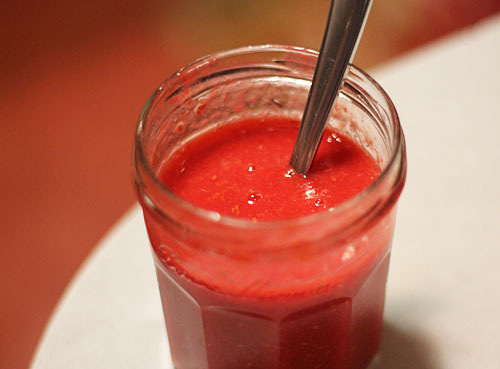 I love the elegance-ease ratio for this recipe – it’s one you could impress friends with, even at the last minute. Nice job (and great notes, as usual). Tee He. I had exactly the same thoughts about what peach melba might be. I’d never heard of it either. SO gorgeous in your parfait glasses! I know that hint about cutting the X, but I forget about half the time…thanks for the reminder!!! You are very right about the X. I usually do the X, but I didn’t make it because I thought, if Dorie doesn’t say to do it, maybe it’s not necessary. 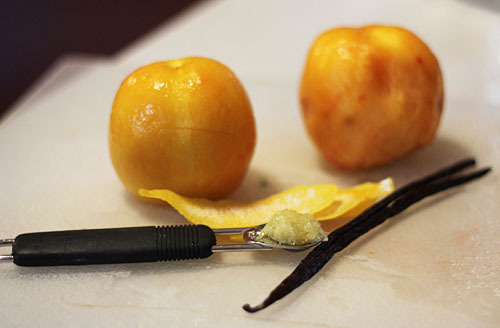 The peaches didn’t peel as easily as usual. Next time, I’ll X those peaches.